Were you ever fortunate enough to play River City Ransom in the 80’s or 90’s? In case you haven’t, River City Ransom was one of the very first action RPG brawlers released for the NES in 1989. Before that time, its developer and publisher, Technos Japan, was busy making a splash with the infamous arcade brawler Double Dragon. Now, more than 20 years later, the famed series has been revived worldwide by developer and publisher Natsume Inc. in the form of River City: Tokyo Rumble for the Nintendo 3DS. Let’s dive deeper into this campy side-scrolling brawler! River City Ransom (or Downtown Nekketsu Monogatari in Japan) featured characters Alex and Ryan, two high-schoolers set out to clean the streets of gangs and rescue Ryan’s girlfriend. You run around punching and kicking baddies, taking their money for use in buying equipment and skills. You use those purchases to repeat the cycle throughout the story until you finally beat the final boss. This time around, River City: Tokyo Rumble goes back to its Japanese roots, bringing the game back to its Japan setting and its Japanese character names and sprites. “Alex and Ryan” revert back to original “Kunio and Riki” namesakes , respectively, as they roam famous Japanese towns and cities, cleaning the streets of the new wide-spread gang called the Lion Alliance. The Lion Alliance seek to control all of Japan as they stationed Lion bosses in those various cities, with each boss appearing progressively more difficult than the last. As Kunio, a well-known hot-blooded gang-buster for justice, you are thrown into the mix when your buddy Hiroshi is jumped in front of your school. After chasing down his assailants, you are then tossed into a gang war for Tokyo. Luckily, you’re not alone. Characters from the Kunio series of video games can be teamed up with, giving you a computer-controlled ally that you can issue basic commands to. Specifically, those commands are used to assign general behaviors to your ally. They are Charge, Help, Back Off, and Your Call – which is your normal. Although you have the option to have no ally, I found that having an ally around to be both useful and somewhat endearing. You cannot play the story with another actual person, so the computer-controlled ally was the next best thing. In terms of the commands, I cannot see the use of any of the commands save “Charge!”. I found the ally to be most the most useful when he or she was going all out, using every special move they knew as soon as the opportunity presented itself. It made sort of made the standard “Your Call” setting sort of obsolete. I just didn’t understand the benefits of telling your ally, “Hey, go out there and… well… sort of hurt people”. That said, when your ally was going all out, it was at times very fun to see them destroy someone out of the blue. It definitely added to the gang-fight ambiance, and in turn, the fun. As for the meat and potatoes, fighting was about as fun if not more fun that the original River City Ransom. River City: Tokyo Rumble’s fighting engine is as comically and campy as ever. The Kunio-kun series of games almost always featured these stubby-looking characters in well-paced combat that surprised you with how violent they can be. River City: Tokyo Rumble was no different as you bash enemies with fists, bats, trash cans, bicycles, and even other enemies. This was complemented with an assortment of classic and fancier special moves that you can teach you Kunio and his allies. Your classics such as Stone Hands, Dragon Feet, and Acro Circus are accompanied by new moves that were once only reserved for your bosses. Want to pull off the famous spinning “Chopper Kick” that only the Dragon Twins could do at one point? Well if you can find the skill to purchase, Kunio can learn it. What I liked particularly about the game’s grinding for stats, gear and moves is how River City: Tokyo Rumble gave you more options to help you acquire them faster. Specifically speaking, River City: Tokyo Rumble now has a sort of job market, letting you take up to 3 side quests at a time and helping you get goodies and buffs as you play the game, with minor detours at times. With previous Kunio beat-em-ups, grinding centered around finding your favorite bad guy to beat up repeatedly until you had enough money to by some skill or boots you have your eyes on. Then, repeat as necessary. Now, you can do that, or do random tasks that give you a break from the story. Sometimes those tasks were more unique, like finding a dog or playing dodgeball against dodgeball Olympians. Other times, you got to fight special bosses and characters from other Kunio games like Crash n’ the Boys: Street Challenge. I enjoyed those particularly as those cameo experiences felt more complete with the inclusion of the specific theme music for those fighters. 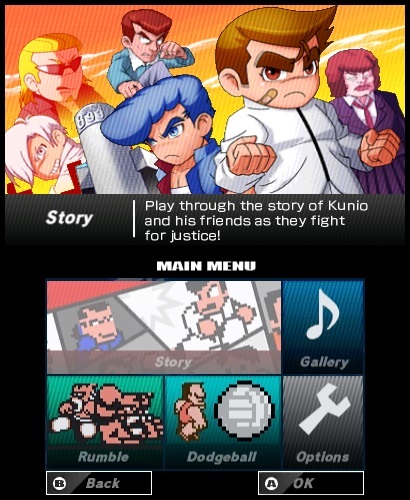 If you played several Kunio games beyond River City Ransom, you’ll find this to be an interesting treat. I sure did. Best of all, the jobs rewarded well, giving you a bump in the wallet, a permanent stat buff, a skill or a unique equipment piece. The story of River City: Tokyo Rumble is delivered quickly, gets to the point fast, and throws you into the action as soon as possible. It’s campy and comical to a point which well established the setting that River City: Tokyo Rumble is trying to portray. It’s a cartoonish beat-up between tough guys that’s fun to pick up and play. Being able to save during all non-event fights is a nice touch that allows you to jump in and out of the game without much trouble. The story mode itself is enjoyable but gives off the air of being a little brief. You may be appeased to know that this may have been by design. There are several features of the game that open up to you when you beat the game, enticing you to play the story again with a new twist. In fact, the story actually makes a specific unique turn the second time you try to beat the game with the same save file. Obviously, I’m going out of my way to avoid spoilers but know that an additional character and battle presents itself the second time around. It’s an interesting approach to adding replay value by mildly hinting that you should, well, play it again… It was not apparent when I first completed the game, but I liked what opened up when I went through a second time. Another aspect of River City: Tokyo Rumble’s replay value lies in its difficulty. In the first play-through, I experienced a somewhat steady climb in difficulty as I progressed through the story. As with many RPG’s, any difficulty you find here can be soothed with more grinding on the side. Once you were strong enough, or more than enough, you can handle any gang or boss the game tossed at you. Bumping the game up to brutal difficulty added some much needed spice once the characters in your save file became too strong. In brutal difficultly, I found that most of the bosses could easily take you or your ally out if you were too careless with your moves. They not only dealt more damage, but they also felt much more aggressive, going after every opening you gave them. Interestingly enough, whether it be through multiple play-throughs or more-likely through my setting to brutal difficulty, the game started to offer new jobs to complete that were not available the first times around. In the end, I still wish the story lasted a tad bit longer, even if it was just for two more bosses. Setting to brutal and aspiring to complete all possible jobs did add to the replay value as it hinted that I haven’t learned all of Kunio’s moves or found all of the secret shops. My stubbornness insists that I completes these tasks, although I’m not sure if there’s anything hidden in the horizon once I did this. Outside of the story, you can play the Dodgeball or Rumble modes locally against friends that do not even own the game. That was a nice touch and a great way to offer to pass-time options for you and your friends. 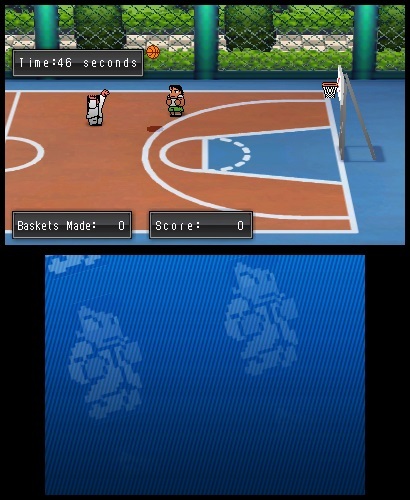 Dodgeball was one of the more popular Kunio games in its day and it is easy learn and play after a match or two. Rumble allowed players to fight in an free for all battle using from characters unlocked from the story. In both modes, each character has abilities and styles unique to them. The character select screen displays how to perform the special techniques. At $29.99, River City: Tokyo Rumble is an enjoyable game that you only wish had a longer story mode. You definitely won’t mind playing it again and again, especially if you’re more of a completionist. The gameplay drags you in and keeps you wanting more. Characters are unique, the special moves are fun to pull off and the difficulty can be as challenging as you want it to be. I would have loved to see two-player story, but Dodgeball and Rumble with friends who don’t even have to have the game is not bad at all. If you were ever a fan of River City Ransom, Crash n’ the Boys: Street Challenge, or any other Kunio-based game, you’re going to love this title. If you never heard of any of these games, it’s definitely worth a look, either way. †Review copy provided by Natsume Inc PR.